Providing you the best range of baby resuscitation trolley with effective & timely delivery. Top tray in head low position. Bottom tray for mounting suction apparatus. Trolley mounted on 100mm dia Castors. 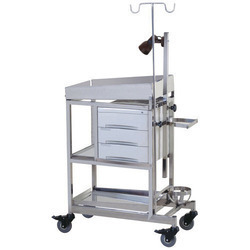 Looking for Baby Resuscitation Trolley ?